How you feel about the performance captured here will have a lot to do with how you felt about Bachman Turner Overdrive. Personally, I always felt they had their hits but their sound and musical scope were pretty limited. If you like that sound, you’ll find that it’s still pretty much intact. In fact, it’s hard to hear any difference between the way these guys sounded on this performance and the way they sounded in the 1970s. Sure, the years have gone by, but if you close your eyes, it’s difficult to tell. Of course, this video is shot well and presented in a great format here, so closing your eyes would be a mistake. The sound is also quite good as they make their way through various BTO hits and also touch on Bachman’s tenure in The Guess Who. Paul Shaffer (yes, that Paul Shaffer) shows up to play on a couple songs, too. 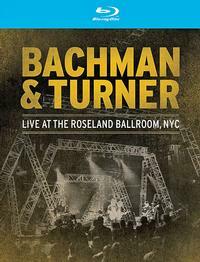 The bottom line is, if you’ve always like Bachman Turner Overdrive, you really need to own this. Even if your interest in the group was more casual, there’s plenty to like here.